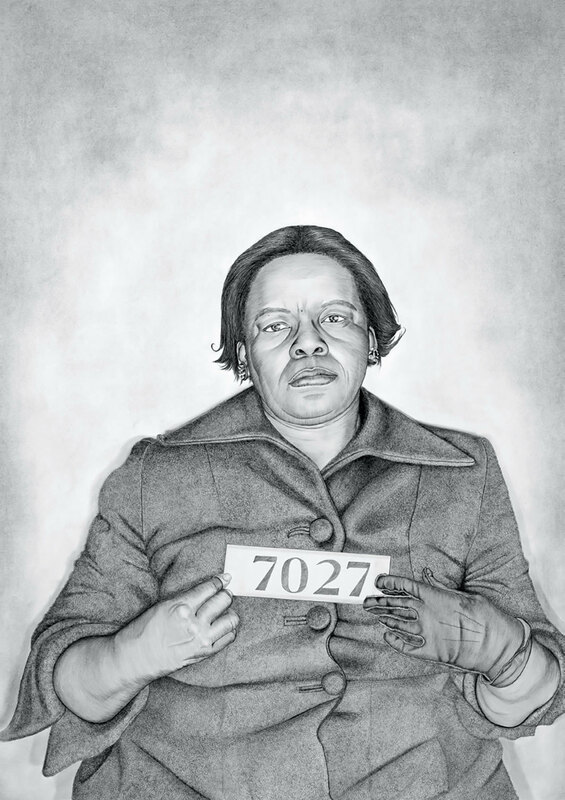 Lava Thomas, Mugshot Portraits: Women of the Montgomery Bus Boycott, Alberta J. James, 2018, graphite and conté pencil on paper, 48 1⁄4 × 34 1⁄2". As is well known, the Montgomery, Alabama, bus boycott began on December 5, 1955, four days after Rosa Parks refused to give up her seat to a white passenger in a premeditated act of civil disobedience. The boycott lasted more than a year, until a federal court’s mandate that the state’s bus system be desegregated. Although celebrated as an icon of the movement, Parks was hardly the only African American woman to become a leader in the struggle against segregation, racial discrimination, and the injustices of Jim Crow. In spite of the focus on male leadership in sanctioned histories, women of all ages played a tremendous role in the postwar civil rights movement.